Amish craftmanship goes into every hen house we make. We offer a wide variety of features to keep your chickens protected and safe all year. Ask about features to keep your chickens warm in winter too. From small backyard coops with runs, to chicken coops on wheels, to large hen houses that hold up to 100 chickens, and custom chicken coops too. Looking to buy a chicken coop that is a little less common but with a great traditional style? Check out the Dutch models. On evenings or weekends, please schedule an appointment if you would like to visit. Monday through Friday 6:30am - 4:30pm we are regualarly in the shop building coops so stop by and see us! Our main entrance address is 400 Newport Road, Leola, PA 17540. Online orders and questions can be phoned in from 9am - 6pm any day of the week (717) 553-0215. Shop Our Most Popular Coops Now - Come take a look at our customers favorite coops! 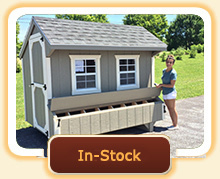 View In-Stock Chicken Coops - Do you need a chicken coop right away? We have in-stock coops ready to be delivered. 1. Epoxy floor option replaces the glassboard floor option. Our new flooring option is more durable than ever. Cleaning your coop and keeping it tidy is easier with an epoxy surface. Just enough texture for chickens to walk on and smooth enough to be cleaned thouroughly. We are sure you will love it! 2. 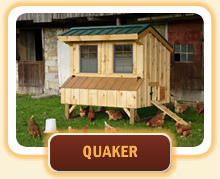 More in-stock coops in our most popular Quaker and Combination styles. They won't last long so call to order yours today. 3. 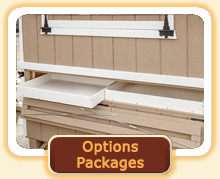 Options Packages - Keep your chickens warm and safe with these great options for your new chicken coop! 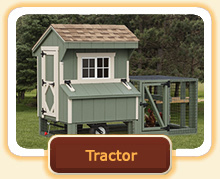 We deliver fully built or chicken coop kits in the U.S.! We have a wide selection of coops from small tractor models for 2-3 chickens that are portable and can be moved around your yard, to large coops for up to 100 hens. We offer many choices of colors and styles, but if you want something different, please ask. We can customize your chicken coop! Please call us or email info@LancasterChickenCoops.com to ask about options and for ordering. We love to help customers! Wheels can be added to most models to make your coop portable. Moving the chicken coop and run around the yard provides fresh grass for your hens and is great to fertilize your yard. 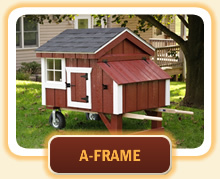 Lancaster Chicken Coops are Amish-made by skilled craftsmen to ensure a safe home for your chickens. When chickens are allowed to roam freely within a chicken coop or backyard they produce free-range eggs; opposed to the confinement that factory-farmed chickens endure. If you'd like to collect fresh, free-range eggs conveniently from your own backyard, call to order your new chicken coop today! Lancaster Chicken Coops come in many different styles and sizes as well as offering customize options so you can build the coop that suits your needs. You will now be able to care for your chickens in style and comfort...and they will thank you by producing top-quality eggs! 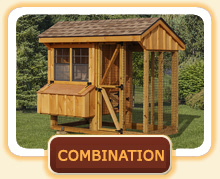 The Quaker style coops and our Combination coops that include a coop and attached run are always the most popular. They each offer benefits for backyard chicken farming. Any of our coops can be made portable by adding a wheel option. Many customers enjoy the benefits of a portable coop. 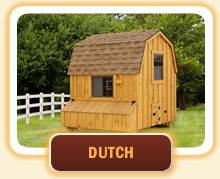 All of our chicken coops have 18 paint color choices and four stain color options. Click here to see the options. Choose from a metal roof, offered in 24 color choices, or shingles that are offered in 9 color choices. There are three wood finish options. For those who want a low maintenance, long lasting finish we recommend painted LP Smart Panel with a finish that can last up to 15 years before needing to be painted again! Call to discuss finishes and options if you have questions. We love to help! Combination coops are a complete solution. By combining the coop and the run, we've made raising chickens in your backyard so much easier. We can even add wire under your run to help prevent predators from gaining access to your chickens. Did you know that our larger combination coops now have space under the coop area because chickens just love to hang out under the coop during warm weather? Tractor model chicken coops are the portable option. 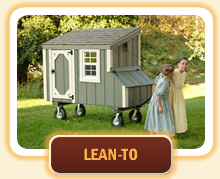 Move your coop around your yard when you add wheels to almost any model, or choose one of our coops with wheels. We offer heavy duty wheel systems and a lift kit that allows the coop to be placed on the ground. The hinged panel option adds chicken run space under your coop and can be used in combination with the wheel option.